Dry eye disease (DED) is a multifactorial syndrome that results in dysfunction of the lacrimal functional unit preventing normal tear production. In the United States, it is reported that up to 33% of the population suffers from DED (1). The annual cost for treating dry eye disease in the US alone is $3.84 billion with a total societal cost of $55 billion (2). Patients that suffer from DED have symptoms that often include eye irritation, redness, ocular discharge, decrease in tear volume, and can cause a significant decrease in the quality of life. Ocular surface pathology often includes superficial punctate lesions, and epithelial defects. Over the last decade it has been established that DED is an inflammatory autoimmune disease, mediated primarily by CD4+ T cells (3). Antigen specific-CD4+ T cells, Th1 and Th17 cells, migrate from regional lymph nodes to the conjunctiva where they produce the inflammatory cytokines IFN-γ and IL-17A. Current data suggests that IFN-γ induced apoptosis of conjunctival goblet cells and IL-17A activates matrix metalloproteinases MMP3 and MMP9 (4,5). These and other factors contribute to break down of the lacrimal functional unit, causing tear instability leading to DED. While no definitive test currently exists in the clinic, the diseases encompasses multiple symptoms and signs and corneal fluorescein staining is only one of the parameters commonly used to diagnose DED. The murine scopolamine-induced model of DED has been used to elucidate disease mechanisms and development of therapeutics for treatment of dry eye disease (3,6,7). Pathology is induced by maintaining strict environmental control of temperature and humidity while animals are exposed to constant air flow and receive daily systemic injections of scopolamine. 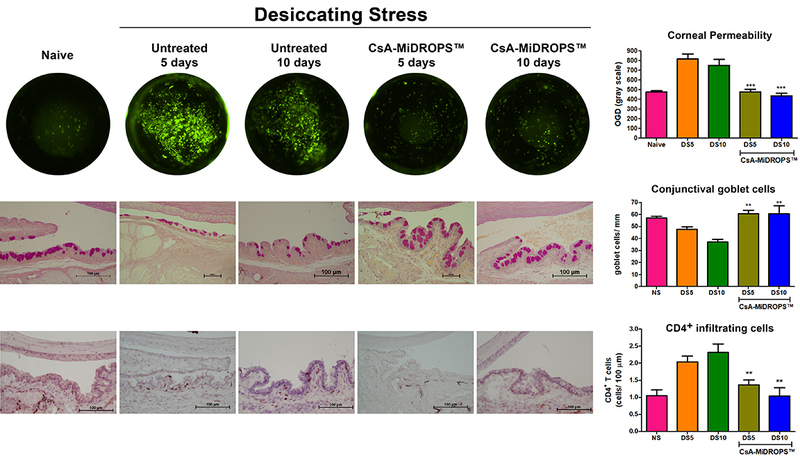 Animals in this model exhibit increased corneal permeability, conjunctival goblet cell loss, increased CD4+ T cell infiltration in the conjunctiva, and increased inflammatory cytokine production, as seen in the human disease (8,9). In addition to quantification of corneal permeability, additional endpoints are available including: 1) Measurement of conjunctival goblet cell density; 2) Quantification of infiltrating CD4+ T cells; 3) Quantification of key disease biomarkers such as IFN-γ, IL-17A, IL-1β, MMP3 and MMP9; 4) Evaluation of corneal smoothness; and 5) Quantification of tear volume. EyeCRO can also provide proprietary CsA-MiDROPS™ as a positive control for the model. 1. Schaumberg, D. A., Sullivan, D. A., Buring, J. E. & Dana, M. R. Prevalence of dry eye syndrome among US women. Am. J. Ophthalmol 136, 318-326 (2003). 2. Yu, J., Asche, C. V. & Fairchild, C. J. The economic burden of dry eye disease in the United States: a decision tree analysis. Cornea 30, 379-387, (2011). 3. Niederkorn, J. Y. et al. Desiccating Stress Induces T Cell-Mediated Sjogren’s Syndrome-Like Lacrimal Keratoconjunctivitis. J. Immunol 176, 3950-3957 (2006). 4. Zhang, X. et al. Topical interferon-gamma neutralization prevents conjunctival goblet cell loss in experimental murine dry eye. Exp. Eye Res 118, 117-124, (2014). 5. Coursey, T. G., Tukler Henriksson, J., Barbosa, F. L., de Paiva, C. S. & Pflugfelder, S. C. Interferon-gamma-Induced Unfolded Protein Response in Conjunctival Goblet Cells as a Cause of Mucin Deficiency in Sjogren Syndrome. Am J Pathol 186, 1547-1558, (2016). 6. Dursun, D. et al. A mouse model of keratoconjunctivitis sicca. Invest Ophthalmol. Vis. Sci 43, 632-638 (2002). 7. Barabino, S. et al. The controlled-environment chamber: a new mouse model of dry eye. Invest Ophthalmol. Vis. Sci 46, 2766-2771, (2005). 8. de Paiva, C. S. et al. Apical corneal barrier disruption in experimental murine dry eye is abrogated by methylprednisolone and doxycycline. Invest Ophthalmol. Vis. Sci 47, 2847-2856 (2006). 9. Dursun, D. et al. Experimentally induced dry eye produces ocular surface inflammation and epithelial disease. Adv. Exp. Med. Biol 506, 647-655 (2002).